The ZIP 49G Smart Media Phone combines productivity enhancing visual communications with the flexibility of the Android operating system, accessed via a 7 inch touch screen, to deliver an outstanding user experience for business professionals. Functions and contacts may be accessed quickly via 27 programmable soft keys. Wired and wireless headsets including Electronic Hook Switch (EHS) function are supported via the integrated USB port. Optional ZIP 450M Color Expansion Modules can provide more programmable keys. 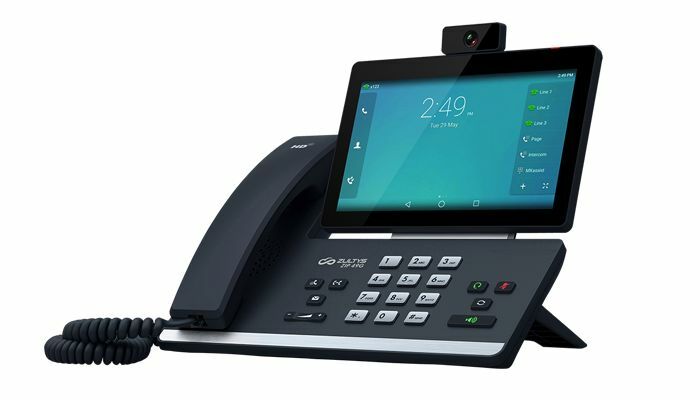 The ZIP 49G is fully compatible with Zultys’ ZAC and MXIE Unified Communication applications, allowing users to manage calls and messages directly from their computer. Like all Zultys phones, the ZIP 49G utilizes the Session Initiation Protocol (SIP) open standard and is managed from the Zultys MX Administrator application for rapid deployment and the industry’s lowest total cost of ownership. Comprehensive integration with leading video door phone intercom providers, such as 2N, CyberData and Baudisch, allows the ZIP 49G to be utilized with building access control systems or to act as a video monitoring end point. One-touch door opening may be implemented with supported solutions. The ZIP 49G may be combined with up to three ZIP 450M Color Expansion Modules to facilitate up to 180 additional LCD labeled programmable keys, making it ideal for operators and receptionists. Staff requiring mobility around the office will appreciate the convenience of Electronic Hook Switch (EHS) control when the ZIP 49G is combined with a compatible Bluetooth or USB Wireless Headset. The Zultys ZIP 49G is designed to save your business time and money. Flexible network connectivity, with dual auto-sensing Gigabit Ethernet ports including IEEE 802.3af Power-Over-Ethernet (PoE) support and integrated Wi-Fi, simplify deployment. Zultys’ leadership in SIP open standards IP telephony for more than a decade provides peace of mind and investment protection.